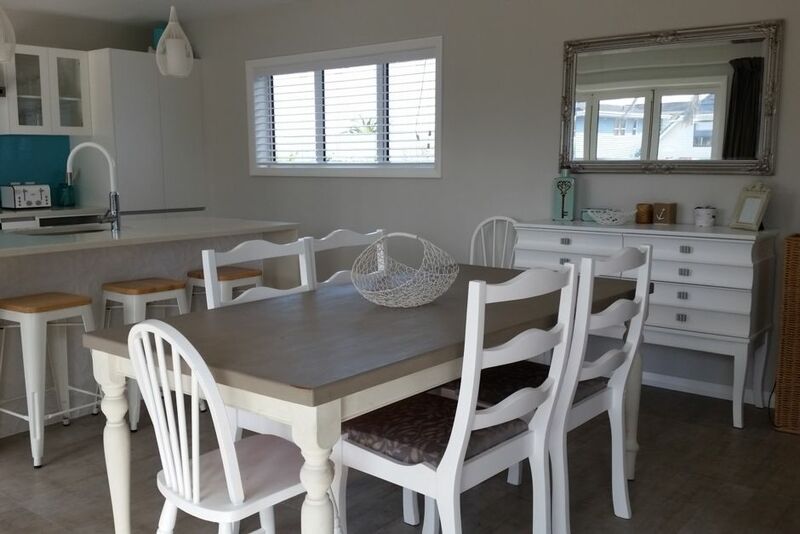 Located on Popular Dickson Road, just one road back from Papamoa Beach Road, all the details have been considered in creating this home for your enjoyment while you are on holiday. Large open plan living upstairs leading directly out to a Sun Drenched Deck for Bbqs and Relaxing in the Sun. Unlimited Ultra Fast Fibre Internet and NetFlix for your Movie Enjoyment. Sporting Four Smart Tvs, Two Gaming Consoles, and Table Tennis for those unfortunate wet days. Two Living Areas with an additional 4th Bedroom/Games Room/Living Room. Additional kitchenette. Plenty of Space for the Kids!! Includes 1 king, 1 queen, 1 double, 4 single and 1 childs (under 6yrs) bed plus a roll away bed can be provided. Just round the corner from Papamoa Plaza, Restaurants, Supermarkets and Fashion Island. 250m walk to a great Park for the kids just down the road! 8 Minute Drive to Baypark Stadium. 16 minute drive to Mount Maunganui - Boutique shopping, Restaurants, Hot pools and Walking tracks. Central to Rotorua (55 minutes), Whakatane (56 minutes), Hamilton (1.3 hours) and Auckland (2.5 Hours). Other tourist destinations such as Taupo, Waihi or Coromandel are a leisurely day trip away. House to be left as you found it. Clean and Tidy. If deep cleaning is required after your stay, additional cleaning charges will be taken off the bond eg Bbq left dirty. Rate per night is for up to 6 guests. Additional guests $35 per guest per night. Ultra Fast Fibre Internet, NetFlix, Gaming Consoles, Table Tennis. Parking can accommodate 2 standard size vehicles off street. Downstairs Living room contains a separate kitchenette and dining table as well as a large corner couch and TV. Upstairs Living room is open plan. Close to amenities and the beach great place to stay. Great location. Close to beach and shops. All facilities you could wish for. Plenty of room for our large group. Excellent location. Clean and tidy. Would definitely stay again.